Russian Orientalist and communal leader; born at Kamenetzetz-Podolsk July 5, 1857. He was educated at home, his teachers being Adolph Neubauer, Senior Sachs, and Hirsch Rabinovich. At the age of twenty he received the degree of "candidate" at St. Petersburg University, after having attended the lectures of Stanislas Guyard at Paris and Baron Rosen at St. Petersburg; later he studied Arabic poetry under Ahlwardt at Greifswald(1879-80). He edited the "Tarshish" of Moses ibn Ezra in a fascicle which was issued by the Meḳiẓe Nirdamim Society, and prepared for the press the Arabic translation of the same work, with a commentary. He published also "Ibn Guzman" (Berlin), and wrote a series of articles on "Metrics," published in the memoirs of the Oriental Department of the Russian Archeological Society (1893) and of the Neo-Philological Society (1892), in the "Journal" of the Ministry of Public Instruction of Russia, and elsewhere. Günzburg is an enthusiastic patron of Jewish art, and is publishing, with Stassov, "L'Ornement Hébreu" (Berlin, 1903). In this book he gives examples of Jewish ornamentation from various manuscripts from Syria, Africa, and Yemen. He has edited a catalogue of the manuscripts in the Institute for Oriental Languages. 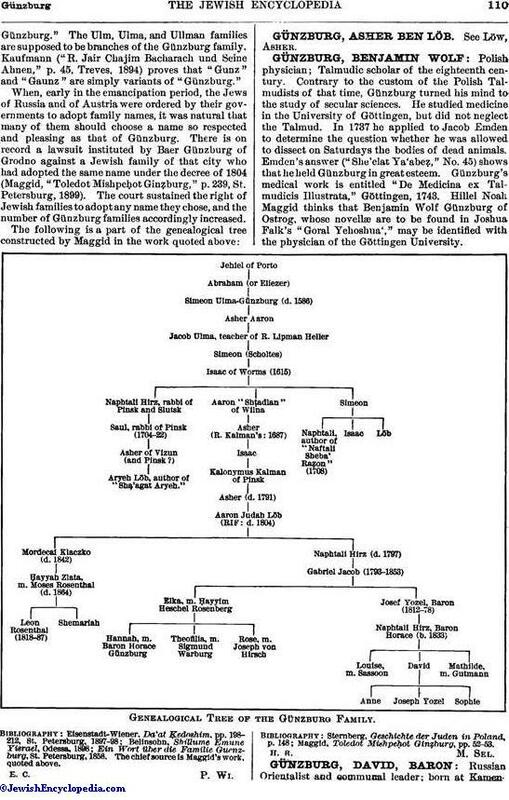 Besides he has contributed largely to the "Revue des Etudes Juives," to the "Revue Critique," to "Voskhod," to "Ha-Yom," and to the collections of articles in honor of Zunz, Steinschneider, Baron Rosen, etc. Günzburg's library is one of the largest private libraries in Europe, and contains many rare books and manuscripts. 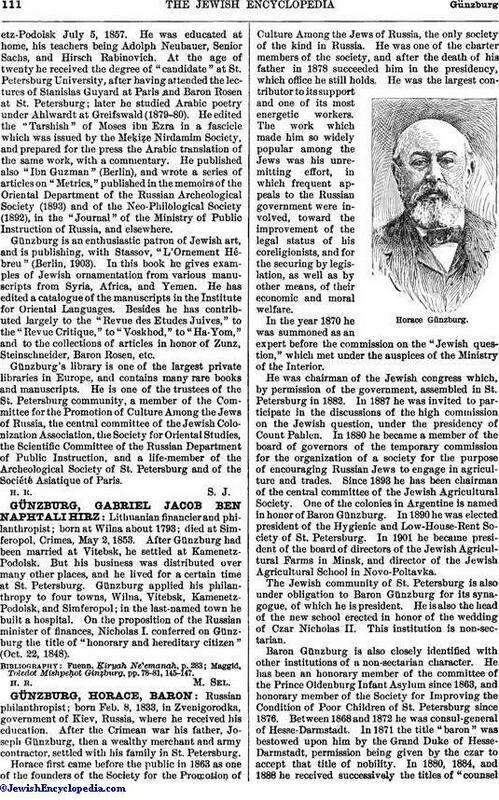 He is one of the trustees of the St. Petersburg community, a member of the Committee, for the Promotion of Culture Among the Jews of Russia, the central committee of the Jewish Colonization Association, the Society for Oriental Studies, the Scientific Committee of the Russian Department of Public Instruction, and a life-member of the Archeological Society of St. Petersburg and of the Société Asiatique of Paris.